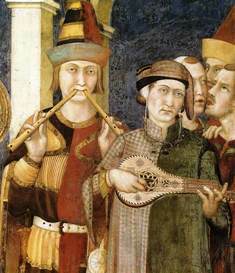 Medieval Musical instruments would be used by the musicians of the period including the Waits, Minstrels or Troubadours. There were three categories of musical instruments in the Middle Ages - woodwind, string and percussion. Haut referred to loud instruments (literally "high" but referring to volume, not to pitch) which were suitable for outdoors. 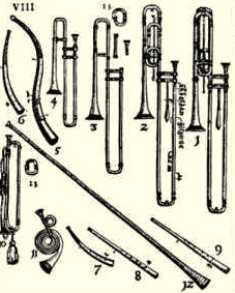 This type of instrument included many Woodwind Instruments including the shawm, sackbut, flute, pipe, bagpipe and tabor. Many of the Medieval musical instruments were the forerunners to our modern musical instruments. Definition of woodwind instruments: a family of instruments that require air to perform and are made from wood. The woodwind instruments use a column of air vibrating within a pipe that has little holes along it to generate vibration with the with the airflow through the pipe and control the length of the sound waves produced by the vibrating air. Different methods were used to create the sound such as blowing across a mouth hole as with flutes) or blowing into a mouthpiece with a single or a double reed. Flageolet - A small fipple flute with four finger holes and two thumb holes. The Medieval Times website provides interesting facts, history and information about the musicians and styles of music which scatter the history books including Woodwind Instruments. The Medieval Life and Times Sitemap provides full details of all of the information and facts about the fascinating subject of the lives of the people who lived during the historical period of the Middle Ages. The content of this article on Woodwind Instruments provides free educational details, facts and information for reference and research for schools, colleges and homework for history courses and history coursework.